Pieter de Geus was born in Waspik, the Netherlands, in 1903. He married Jeanne Adelaide van der Made in Rotterdam in 1926. Their first two children were born in Rotterdam. Pieter de Geus and his wife, both teachers, moved to Semarang in the Dutch East-Indies, where two more children were born. Pieter was conscripted into the Dutch armed forces and subsequently taken prisoner by the Japanese. His wife and family were also interned in a Japanese camp for the duration of the war in Asia and the Pacific. 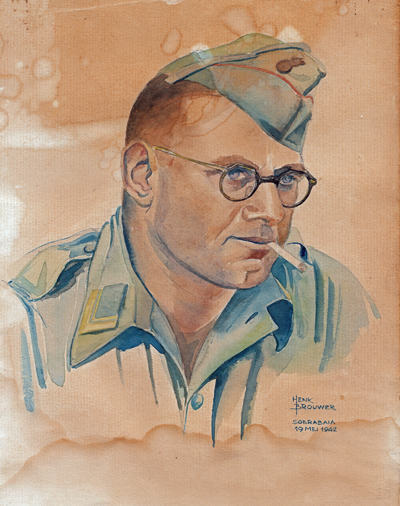 After ceasation of the war Pieter was discovered in poor condition in an isolated jungle prison camp by a British group, led by the wife of Lord Louis Mountbatten. After the war he was re-united with his family and resumed life in Indonesia. Pieter and his family subsequently moved to New Zealand because of the anti-colonial unrest in the former Dutch colony. Pieter died in New Zealand in 1969, 65 years old.